The Copyright Act 1968 (Cth) exempts from infringement a fair dealing “for the purpose of parody or satire”. The statute is silent as to whose purpose falls within the ambit of the exception, and whether it extends beyond the parodist’s purpose to the purpose of third parties involved in the production and dissemination of parody. A 1990 Federal Court case, De Garis v Neville Jeffress Pidler Pty Ltd, effectively excluded third-party purpose, and while occasionally overlooked it has not been overruled or expressly disapproved. De Garis isolates many third parties from immunity, and its potential application to the parody exception is particularly problematic, because parody relies on third parties for its dissemination. This may defeat or seriously hamper Parliament’s objective in introducing the exception, which was to enhance public access to copyright material and allow it to be used for socially useful purposes. The potential for De Garis to fetter the parody exception has been noted by the Australian Law Reform Commission and others in advocating the introduction of a US-style fair use exception. The Commission’s 2013 recommendation to introduce a fair use defence was ignored, which dilutes confidence that the Productivity Commission’s identical recommendation in 2016 will be adopted. If fair use reform seems unlikely, it is more important than ever to perfect the purpose construction in the fair dealing regime. This article explains the problems generated by De Garis and advocates for a flexible interpretation of purpose that accommodates the important role played by third parties in disseminating parody. The Protection of Plant Varieties and Farmers Rights Act 2001 (In) provides for the protection of new plant varieties, extant varieties and farmers’ varieties. This article reviews the form and scope of these variety rights compared to existing international intellectual property standards for new plant varieties to demonstrate a significant evolution in the conception of a property right. The article asserts that the form of the new plant variety, extant variety and farmers’ variety rights establish a de facto permanent property right by requiring applicants to declare lawful acquisition and document plant material histories. While for extant varieties and farmers’ varieties this might provide some guidance about the form and content of the presently uncertain Farmers’ Rights and Traditional Knowledge, the article concludes that for new plant varieties this orders the public domain so that future breeders, evolvers and developers may not have unrestricted access and use to breed, evolve and develop new plant varieties. One of the peculiarities of the ever closer economic relationship between Australia and New Zealand is the dissimilarity of the intellectual property laws, at least in matters of detail. The legislation that protects trade marks is no exception. New Zealand’s Trade Marks Act 2002 is largely based upon the United Kingdom model, which is in turn influenced by European law. That can make for challenges when interpreting key sections. It also means that the New Zealand legislation contains provisions not seen in the Australian law. New Zealand has, too, some truly indigenous provisions such as a prohibition on culturally offensive signs. The Australian Act follows its own distinctive structure and wording, although both countries share a British heritage. The aim of this article is to discuss particular areas of interest in trade mark law in order to draw out some contrasts between the two countries. Three broad aspects are covered: trade mark “use”, infringement and registerability. Hard conclusions are elusive, with a number of provisions remaining untouched by case law. But whilst on occasion there may be room for disagreement, it seems that in general the respective judges have a similar approach to the issues, and despite the, sometimes stark, differences in the provisions, much the same legal result is likely to arise in each jurisdiction. 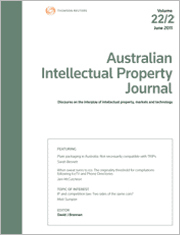 For the PDF version of the table of contents, click here: AIPJ Vol 27 No 2 Contents.